For those of you who are still in mourn over the loss video site Stage6 you are in luck as Vreel.net is coming soon! Vreel is essentially the replacement site for Stage6. Formerly called DivXIT.net (which surprisingly still points to Vreel) and gaining a lot of traffic; DivX inc. issued a cease and desist order against the website for copyright infringement. The staff then signed over the domain name for a free license from DivX. Vreel received a license from DivX to use their codec which allows some very cool web player options. I have been privy to review and test out their closed beta I have to say I am quite impressed! Great things are coming from this video site. Here are a few screen shots of the site. I think the design is very smooth and has a real comfortable feel for hanging out and watching videos. 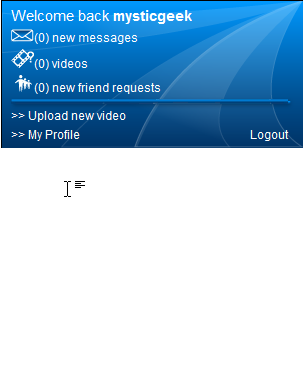 This is a shot of the video categories and the user control panel. Keeping in the Stage 6 tradition there is also an Anime specific category along with a Japanese culture section. To use the site you will need to install the DivX Web Player which works seamlessly with all the videos I have watched so far. I love the Windowed Mode feature that allows you to pop out the video and place it anywhere on the desktop. I had the opportunity to interview the founder of Vreel, Eoin. Here are a few highlights of the interview. Mysticgeek: What is your vision for Vreel? What do you see it as now and what do you hope to accomplish in future years? Eoin: Vreel right now is in its infancy – there’s so much work to do, and our developers are working extremely hard to get everything running as soon as possible. The closed beta testing has really opened our eyes to the scale of Vreel – the current takeoff makes it literally impossible to estimate our growth over the next few months. If you had asked me in May how many visitors I expect in a years time, I would’ve said 10,000 a day – we’re currently breaking that figure, and look set to double on it over the next few weeks. Mysticgeek: Can you give us a brief explanation of the “controversy” surrounding Stage6 with DivX and what Vreel will have to offer now that you have an official agreement with them? Eoin: Honestly, as far as DivX and the Stage6 closure go, I’ve got about as much information as anyone else. It was there one day – and the next it was gone. No solid reason was ever given for this, bar stating that the stage6 platform was “very expensive to maintain” – DivX were also facing a potential lawsuit from UMG at the time of closure. It’s also rumored that Live Universe made an offer to purchase DivX – an offer which they promptly declined. I should make it clear that Vreel has NO commercial ownership over the DivX webplayer and codec – these are property of DivX, and DivX alone. DivX have given us permission to use their codec and webplayer within the Vreel video environment – allowing us to create a viable High Definition video platform, while incorporating our own features around that core basis. Mysticgeek: I know a lot of people are chomping at the bit for this site to go live to the public. Can you give us an estimate on that will be? Eoin: You can say that again – right now, we’re resolving the many bugs found during closed beta – the big ones right now being aspect ratio issues (problems with files not uploaded in 4:3 or 16:9), and some slowness in conversion – we want these issues ironed out before releasing an open beta. As I’m sure you’d agree, our first impression is going to be everything – and I know I’d personally rather a delay than a half-functional portal. Regardless, progress right now is fantastic – we should be looking at these issues stamped out over the next few days, along with a host of new features being tested over this period. We’ll have open beta testing once these major issues are sorted out – but until then, we’re going to accept users into our closed beta daily. Finally a cool short promo for video for Vreel.net created by one of the current forum members.